Located off of U.S. Highway 42 in La Grange, Sycamore Run is a beautiful neighborhood with homes on around an acre of land. Homes in Sycamore Run began construction by the builders, The Jones Group, in the early 2000s. The above grade square footage in these homes is usually between 1,600 to 3,500 square feet. Typically, you will find between two to four bathrooms and three to six bedrooms in Sycamore Run homes. The price range of homes in Sycamore Run is anywhere from $235,000 to around $330,000. The most common construction of homes in the Sycamore Run neighborhood is brick. There are a few homes that are vinyl and others have a mix of wood or veneer, but not many homes are this style in Sycamore Run. The Hollinden Team updates this search for Sycamore Run houses for sale on a daily basis from the Louisville MLS. We have helped many clients buy and sell homes in La Grange. Be sure to check out The Hollinden Team's reviews. 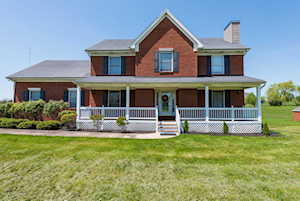 Click the map to the left to view each home for sale in Sycamore Run. There is a satellite view button in upper right. Almost all homes in Sycamore Run have a basement and many of these basements are walkout. Ranch homes are very common in this subdivision but there are a few two-story homes mixed into the neighborhood. Many of these homes have very open floor plan concepts and vaulted ceilings. Sycamore Run homes are traditional style homes. Many of the homes have beautiful porches on the front of the home, perfect for sitting outside with your lemonade on a warm day. Grocery shopping is very close to Sycamore Run. The local Walmart and Kroger is only about 6 miles away from Sycamore Run. For other types of shopping, you may enjoy Downtown La Grange. Downtown La Grange is a very quaint area that many people enjoy visiting to shop and dine. There are various types of stores in Downtown La Grange like wedding stores, consignment stores, art galleries, craft stores, etc. There are a few great restaurants in Downtown La Grange well. For larger shopping centers, there are several places to shop in Louisville such as Oxmoor Mall, Mall Saint Matthews, Westport Village, and The Paddock Shops. Most of these shopping centers are around 20-30 minutes away from Sycamore Run. The two golf courses in La Grange are Eagle Creek Golf Course and Oldham County Golf Course. Both courses are 18-hole golf courses and open seven days a week. However, Eagle Creek Golf Course is public and Oldham County Country Club is semi-private. The home schools to Sycamore Run are the following: Buckner Elementary, Oldham County Middle School, and Oldham County High School. Oldham County is known for their award-winning school district. Buckner Elementary is actually one of the highest performing schools in the Oldham County School District. If you would like to learn more or have any questions about any of these Sycamore Run houses for sale, or others in the zip code 40031, just click the "Request More Information" button on any property detail page. The Hollinden Team can provide you with past sale information, comparables, disclosures, PVA assessment, and tax information – we would love to answer any real estate questions you have.